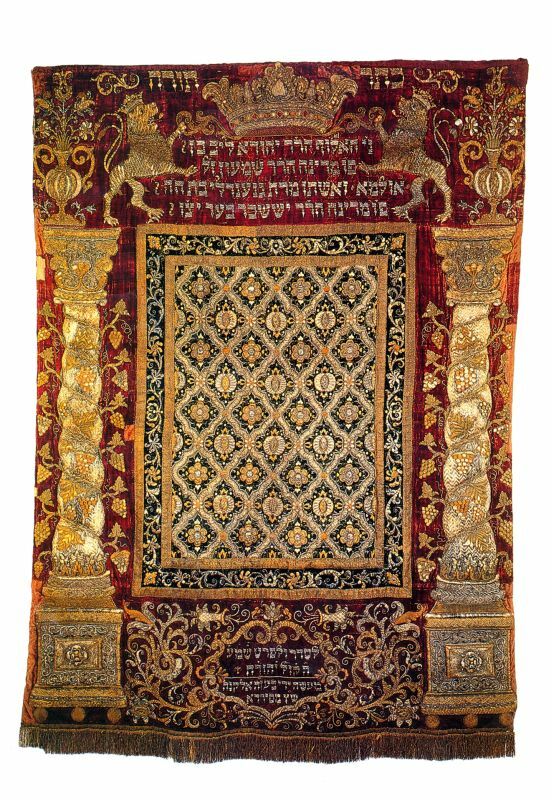 This resplendent Torah ark curtain is a rare surviving example of the prolific craftsmanship of the male Jewish embroiderers who worked in southern Germany in the early eighteenth century. Such Torah ark curtains were very costly and were usually specially commissioned by wealthy Jews. The main embroidered inscription on this one testifies that it was dedicated by R. Judah Leib and his wife, Gnendl, while another inscription on the bottom bears the name of the embroiderer. Designed to recall the shape of the ark itself, the curtain is adorned with twisted columns entwined with vines and grapes and a pair of crowned rampant lions supporting a large crown. In addition to their decorative qualities, these images have an underlying meaning, referring to the lion of Judah and the three crowns symbolic of Torah, priesthood, and royalty.